At last year’s Interop Las Vegas, OpenFlow was the surprise sensation of the show. In fact, Network World went so far to argue that it could have been called the OpenFlow Show. We had high expectations for this year, and we were not disappointed. OpenFlow was everywhere at the show, whether as generally available products, demos or prototypes. It received (again) the “Best of Interop Award” and it was the elephant in the room during Cisco’s keynote. At the same time, the conversation around OpenFlow has changed. If last year was around hype and speculation, this year was around products, use cases and in a few cases customer success stories. Here is our list of OpenFlow related exhibits at Interop. If we are missing anything let us know in the comments. Arista – At the Arista booth, there was a joint demo together with Big Switch Networks to showcase Network Virtualization using OpenFlow. Several of Arista’s 7050 Switches were used to create virtual networks leveraging both the switch’s hardware capabilities as well as Hypervisor Switch based overlay networks. Arista’s EOS architecture is very well suited for Software Defined Networking and it is great to see another OpenFlow enabled switch becoming available. The network virtualization functionality was provided by the Enterprise version of the Big Switch Controller. It provides redundant controller nodes for high-availability and management is done via an industry standard CLI or Web UI. 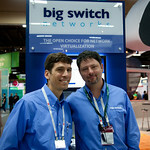 To the right Dan Talayco and Jeff Townsend from Big Switch. Next week is Interop where OpenFlow will be displayed in various vendor booths and, similar to last year, in it’s own “Interop Labs” OpenFlow booth. I was Las Vegas this week helping setup and wanted to share this snapshot of the progress. Last year’s Interop Labs booth really put OpenFlow on the map and this year is shaping up to be even better!